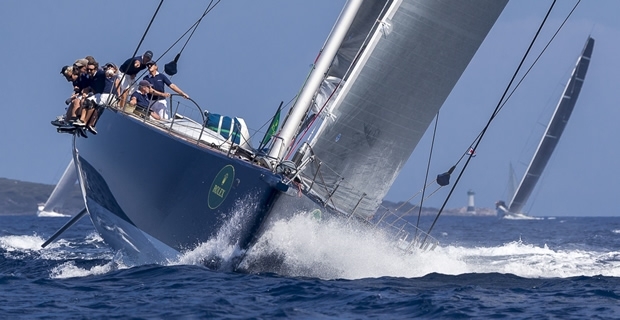 The penultimate day of the Maxi Yacht Rolex Cup and Mini Maxi Rolex World Championship dawned with unpromising, light and shifty winds that caused starts to be delayed. However by 1300 the northeastererly wind had filled in enough for the race committee to send all of the classes off on a coastal course culminating in a classic Maxi Worlds final run back to Porto Cervo in 15 knots. At the close of play, winners in some classes are already a mathematical certainty. Firefly (Supermaxi), Highland Fling (Maxi) and Lupa of London can approach tomorrow's race with the knowledge of having secured overall victory in their fleets. In the Wally and J-Class divisions meanwhile the field is still wide open and respective leaders Y3K and Lionheart will have a fierce battle on their hands. Andres Soriano's Alegre leads among the Mini Maxi Rolex World Championship but, with two final windward-leewards to be held tomorrow, her position is by no means safe. In the Mini Maxi Racing Class, the first short beat was crucial. Alegre started well at the pin end and was first to the top mark. She and Robertissima then proceeded to extend away from the rest of the Mini Maxis. At the Isola di Mortorio turning mark, Alegre was 50 seconds ahead of Robertissima and ultimately Soriano's Mills 72 won the race by two minutes on corrected. John Kostecki, serving as tactician aboard Alegre commented on today's race: "We got a good start and we sailed well up the first leg and rounded the mark first, we tried to cover Robertissima. It was a fairly simple race today because the wind conditions made for a lot of reaching so not a lot of tactics, it was just a question of getting from one point to another as well as possible." Sir Peter Ogden's JV72 Jethou enjoyed a close battle today finishing just 15 seconds behind Hap Fauth's JV72 Bella Mente, but winning on corrected. “The standard in this fleet is very high,” commented Ogden. “Jethou has a mixture of amateurs and top professionals, everybody else is fully professional, which make it quite difficult, but you can see by the results that we are so evenly matched. On board we have people like Brad (Butterworth) and Simon (Daubney) but it is very interesting, they act more as teachers, they are not pulling the strings all the time but trying to improve the team's performance by simply talking to them and the crew love it." Alegre, which has held a slim lead since day one of Mini Maxi Rolex World Championship and now sits three points ahead of Roberto Tomasini Grinover's Robertissima while Niklas Zennström's new JV72 Rán 5 only manage a sixth today but still holds on to third place overall. However Soriano and his crew are all too aware of having been in this same situation for the two previous years, only to lose the event on the final day. By winning the third coastal race with her closest rivals, Rainbow, sinking to a fourth place between the final mark and the finish line, Bouwe Bekking and the Lionheart crew lead into the final day by one single point. The crew which have won both of the season’s J-Class regattas so far were comfortably clear, well ahead of what proved to be the most exciting finish of the event so far. All the way down the final brisk run Rainbow was challenging Ranger for second place. The stakes were high. If Rainbow could steal second they had a chance of finishing the day on the same points aggregate as Lionheart, retaining a share of the regatta lead. But Velsheda took full advantage of the tussle. She sailed the more direct, faster course to close right up on the duelling pair engaged in a luffing match. And when Rainbow sailed slightly wider at the final turn, making ready to flip over and break Ranger’s cover, Velsheda squeezed inside and closed the door on Rainbow, despatching her to fourth. With up to two windward-leeward expected for Saturday, the stage is set for an engaging finale with the possibility of the most wind so far, adding to the spectacle and the challenge. The course did deliver different points of sail, with the NE breeze between 9 and 14 knots. Lionheart led at the first windward mark by about 1 minute and 23 second with Rainbow third 12 seconds behind Ranger. By the first leeward turn at the Mortorriotto Rocks, Ranger had cut her deficit back to 55 seconds, but the leaders gained time as they went into the new more westerly breeze as they beat across the most westerly mark by the south end of Caprera Island. From there the black hulled, black sparred Lionheart could steadily move away to finish two minutes and 36 seconds ahead of Ranger. Having worked hard down the last long run Velsheda seized the opportunity when it presented itself. Tactician Tom Dodson paid tribute to the helmsmanship of Velsheda’s owner at the tight, precise mark rounding: “The Owner did a lovely job steering then and it felt really good to get that place at the end. We needed it then and we got. The race was a bit of a procession up to then so we were happy to get back into it. We saw Rainbow and Ranger having their little battle and we just took the shortest course down there. We benefited from their match race. He did a great job. We had more speed than these two boats and he did great work keeping it tight on the mark. Rainbow were wanting to flop on to port, we only needed to get our bow inside them like we did to stop them tacking. The nine-strong Wally Class is producing the closest finishes, since it started racing in the Maxi Yacht Rolex Cup. Currently IMA President Claus-Peter Offen's Wally 100 Y3K and Jean Charles Decaux's Wally 80 J-One are tied on points for the lead with Sir Lindsay Owen Jones' Wally Cento Magic Carpet 3 is just a point behind. See her blue hull power her way up through the Mini Maxis was one of the highlights of today's racing. Victory in today's race went to the Wally 80 Ryokan. In the Supermaxi, Mini Maxi Racing Cruising and Maxi divisions, the leaders tied things up a day early with their performances today. Bullets for Firefly, Lupa of London and Highland Fling ensured their places on the podium. Sir Irvine Laidlaw, owner of Highland Fling, was understandably happy on his return to shore: "We had great wind today. It was a real bonus as the breeze was so light this morning we didn't think we'd be able to do anything. But in the end it turned out to be a fantastic race, incredibly enjoyable." Tomorrow, big conditions are set for the grand finale with wind speeds of 20 knots, which would make for a spectacular finale.